Women, especially single mothers, are oppressed economically and culturally. Education for women and a few men, many of whom lack a sixth grade education, helps in developing independence, self-sufficiency and personal dignity by learning and using marketable skills. In 2015, 40 women graduated from the Covenant's programs, equipped to start their own business out of their home or find work in the Free Trade Zone factories. This also enables families to create their own clothing, and gain a level of self sufficiency. The school, which is based at the Agua Viva AICN Church, is run by Pastor Megaly Sanchez, who has great teaching skills. She started the school in 2012 to provide marketable skills for people who desire a better future for themselves and their families. Graduates of the program get certificates that are widely accepted for employment in the garment industry. a student with the full two semester training program. Some of the graduates will seek employment in the "Free Trade Zone" , for a steady cash income to support their families. However, the working conditions and hours are very difficult, especially for mothers with young children. Some graduates have found an answer by doing contract work out of their home, enabling them to be with their children. Others have joined co-ops, producing clothing for sale in their local market. 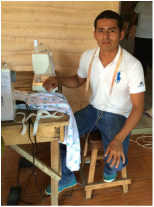 Ariceli is 18 years old and is determined to be self sufficient by acquiring a skill that provides financial independence. She takes 3 buses to get to the school and is a star student. Hernaldo was working in the "Free Trade Zone", but wants a better future for his family. He works part time for a tailor, but is studying to gain the skills needed to open his own tailor shop. The students are producing a variety of items while taking classes- below are a few examples. Sewing machines are needed. The Colonia School has only 4, aging machines- local purchase is $250.00. Importing the machines is not advisable due to replacement parts issues. $250 donation to purchase a machine for a graduating student. Fabric needed- lightweight, brightly colored, cotton and larger cuts preferred. Also needed- buttons, snaps, tape measures, lace, etc. $ 80 supports a student for one semester. Vilma is a single mother who lives in the community of Los Huerfano’s a distance of 14 kilometers from the sewing school. Vilma always felt a desire to learn dressmaking. She traveled 8 kilometers on foot to where she could catch a bus to travel the final 6 Kilometers to the school. 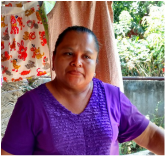 Vilma’s dream is to learn well and obtain her own sewing machine. With her own machine she believes she can support her children and find business within her community, as there are no dressmakers there.